Axial’s Ready-to-Run (RTR) vehicles are true hobby-grade products and, as such, they use sophisticated electronic components. One of the primary advantages to such high-tech gear is adjustability and an area of adjustability includes battery type. 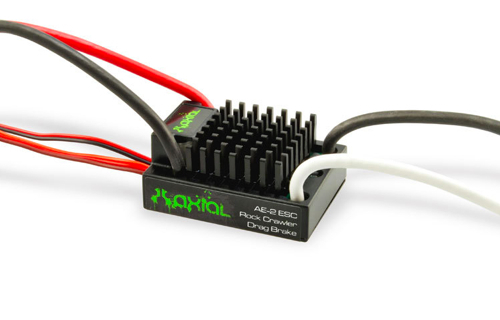 Axial’s electronic speed controls (ESCs) are designed to be used with a variety of battery chemistry types and can, and should, be adjusted for the type of battery you’re using. 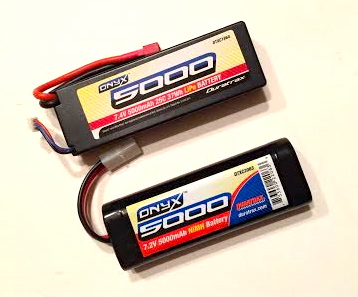 IMPORTANT NOTE: As a safety measure, Axial uses the LiPo setting as the default setting on the ESC, but NiMH batteries, are often recommended for use with RTRs. NiMH batteries will provide best performance when the ESC is used in NiMH mode. LiPo batteries must be run with the ESC set in LiPo for safe use. This isn’t optional. When properly set in LiPo mode, Axial ESCs are designed to eliminate the chance of over discharging the battery and permanently damaging it, which is a potential safety issue. As such, LiPo batteries should never be used in any other mode other than LiPo mode on the ESC. NiMH batteries will work in LiPo mode, but there will be a noticeable reduction in performance that will suddenly become apparent as the pack starts to lose voltage (discharge). This is because LiPo mode has what is called LiPo cutoff or low voltage cutoff. As the voltage drops in the NiMH pack, it is still delivering usable power, but the LiPo cutoff engages and impairs performance. 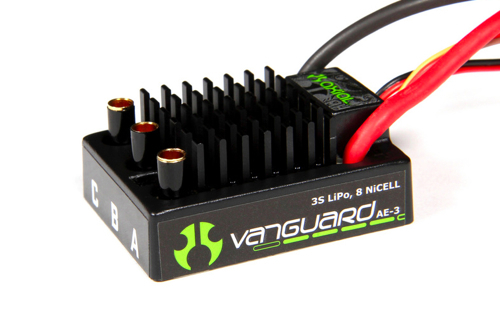 The LiPo cutoff is designed to reduce power to the motor in order to keep the battery at a safe minimum voltage. Let’s go over setting up NiMh mode on the various Axial ESC offerings so you can get maximum performance when using this type of battery. AE-2. 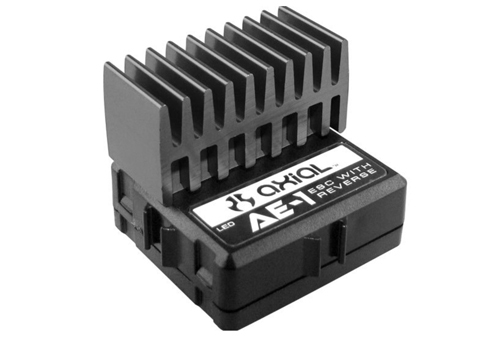 The AE-2 is a brushed motor speed control. While Castle Creation’s Castle Link system can be used to link the ESC up to a computer (availabe as an aftermarket item,) for ease of use, the AE-2 can be programmed manually by using the throttle trigger on your transmitter to indicate yes or or no to selections as you scroll through each option. To get the best performance when using a NiMH, the ESC should be programmed to operate in NiMH mode. When programming, as a safety measure, remove the pinion from the motor. This will prevent the gears and/or vehicle from moving and causing damage to the vehicle or you. Turn the transmitter on and then connect a freshly charged battery to the ESC. Hold full throttle and turn on the ESC. You will hear four tones from the ESC and then another four tones. After the second series of four tones, release the throttle. The ESC will beep twice indicating you’re in programming mode. There are three settings that can be adjusted on the AE-3. Each setting, in turn, has a varying number of options. You will use your transmitter’s throttle to select yes (full throttle) or no (full brake) for each option. When you select yes, the next setting will come up. Every time you select no, you will toggle to the next option within that setting. When you select yes or no, wait for a continuous tone and let the throttle go to neutral. If you selected yes, the ESC will go to the next setting. To change to NiMH mode, you will need to go to the first setting. Remember, LiPo batteries must be used LiPo mode. Vanguard AE-3. The Vanguard AE-3 is a brushless motor speed control. It comes preprogrammed in the “Auto-LiPo” mode. Like the AE-2, you can use the Castle-Link to program the ESC with your PC, but you can also manually program the ESC with your transmitter. When programming, as a safety measure, remove the pinion from the motor. This will prevent the gears and/or vehicle from moving and causing damage to the vehicle or you. Turn the transmitter on and then connect a freshly charged battery to the ESC. Hold full throttle and then turn on the ESC. You will hear four tones from the ESC and then another four tones. After the second series of four tones, release the throttle. The ESC will beep twice indicating you’re in programming mode. There are nine settings that can be adjusted. Each setting, in turn, has a varying number of options. You will use your transmitter’s throttle to select yes (full throttle) or no (full brake) for each option. When you select yes, the next setting will come up. Every time you select no, you will toggle to the next option within that setting. When you select yes or no, wait for a continuous tone and let the throttle go to neutral. If you selected yes, the ESC will go to the next setting. To change to NiMH mode, you will need to go through settings one through six to get to setting seven, which changes the battery mode. Remember, LiPo batteries must be used LiPo mode. Option 3: Crawler Reverse. No delay from throttle to brake to reverse. AE-5. The AE-5 is a brushed speed control and is by far the easiest ESC to program. To switch from the factory LiPo mode, remove the “jumper” and move it over one position. Not only is this ESC easy to program, it’s also waterproof. AE-1. 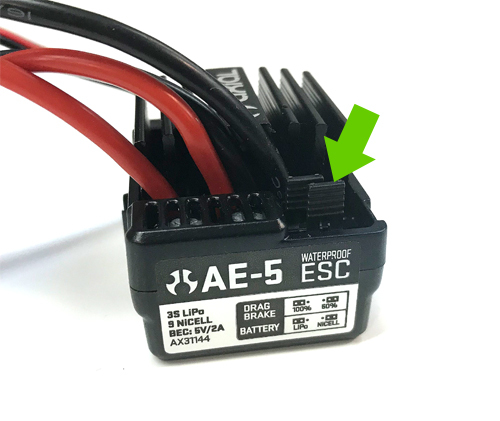 Axial’s AE-1 ESC does not have a LiPo cutoff. If you use LiPo batteries in a vehicle equipped with an AE-1 ESC you must use a separate LiPo low-voltage cut-off device. 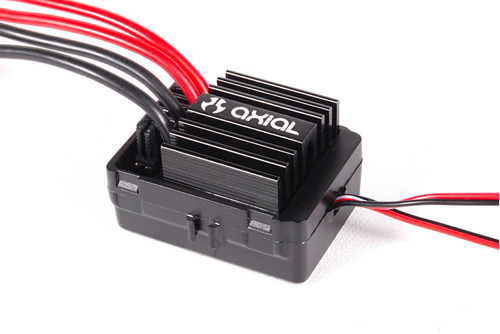 Axial does not sell a separate LiPo cut-off device, so the best choice would be to upgrade to an ESC such as the Axial AE-5 (see above), which is extremely easy to program and waterproof.